We hired Dana for a birthday party with twenty five attendees. She and her staff were prompt, well prepared, professional, and pleasant. The food was fresh, perfectly seasoned and beautifully presented, and they left the house cleaner than when they arrived. I highly recommend the Beach Plum Chef! Dana came through for us with a last-minute birthday dinner request, and it couldn’t have worked out better. The cod/lobster main dish was delicious, and the crab cakes are the best we’ve ever had (and we’ve tried them all over north america!). Her carrot cake was unbelievably good. Dana worked with our budget and made sure our dinner was perfect for the whole family, including our young kids. We used the Beach Plum Chef services for a series of dinners/lunches this summer in North Truro. The numbers varied from 7-14. Dana and her assistant were very professional, efficient and friendly, despite all the chaos going on around them, including 2 large dogs. The party was a tremendous success and what a wonderful celebration it was for our family. Everyone absolutely raved about the food and so appreciated the extra care that went into making sure all medical concerns were addressed in a very professional and caring manner. We would enjoy having you cook again for our family in the future. That was a delicious meal! Definitely the best dinner we have had on Cape Cod in the five years we have been coming here. We will recommend you to our friends. Thanks also for the restaurant suggestions. anything. Enjoy the holiday weekend and the rest of your summer! Thank you! They are very happy with everything. It is such a treat for my mom (and my dad). You made everything so easy for them. I really appreciate it. I want to thank you again for the wonderful feast that you created for Dan and Daniella’s wedding dinner party. We all appreciated the thoughtful presentation, the creativity, the balance of flavors and the aesthetics of your plating. I know Dan and Daniella enjoyed the process of creating the menu with you and you clearly listened to their ideas and embraced their desires. I hope you have a wonderful holiday and wishing you a healthy New Year. Dana provided personal chef services for my family and friends over our month long annual summer retreat to Cape Cod in the summer of 2013. We had a difficult set of requirements as we had anywhere from 5 to 14 people at different times. Dana would come a couple of times each week and would prepare and serve that evening’s meal as well as prepare dinner for the next night or two. The food was always delicious and the presentation was fabulous. Dana was quite flexible in meeting our needs and put a lot of effort in up front communicating with us to develop menus that matched our tastes. Dana even allowed our teenage kids to work with her on some of the meal preparation and took the time to teach them some of the finer points of cooking. We also hosted a casual neighborhood party for some 30 people during our stay, and Dana prepared the main courses and several sides. All of her food received rave reviews and her services made if much easier on us to host the party. Dana is a pleasure to work with and a most talented chef. We look forward to more of her fabulous cooking on future trips to the Cape. Feb 2014 – Best Christmas present I received this year! Thanks for great classes, Trish and I have enjoyed your cooking, and received a lot from working with you. Not to mention I can actually cook vegetables now, and can make a fairly respectable dinner. Good work! Until we meet again. Dana I just want you to know how much your presentation was enjoyed by the club members. So many people came up to me to tell me how much they had received from the class. And the samples were delicious. Also, I would like to compliment you on making a catering menu that perfectly fit our annual “Weigh for Life” six week goals – you were the right person for that job. It was really great having you – thank you! We all learned a lot. Once again you did an excellent job, nicely done Dana. A lot of people wanted to know how you made the chocolate pie. Maybe you could drop off the recipe…. Thank you. And you really went overboard on the cleaning up – you didn’t have to do all that. We’re looking forward to our next event. You did a fabulous job. Thank you for the last minute menu and for the event advice. Everything was excellent… the homemade chowder, the grilled beef…. The Asian chicken appetizer was different and really good. We liked everything. The people you worked with were very nice. My wife and I couldn’t have been happier – I’m happy when she’s happy. Thanks for helping me to make this a really special birthday event for my sweetheart! I will definitely recommend your service. What a treat to wake up to such a clean kitchen, but the real treat was your dinner. Every course was delicious and presented perfectly. And the left-overs! They made a light lunch on Saturday and when my son arrived, he devoured the potatoes. Thank you for making Bruce’s dinner a special one. It was such a pleasure having you cook for our “foodie” friends from NYC this summer. We were all very impressed with the delicious baked haddock and pan seared sea scallops. I thought the Boston lettuce salad was particularly yummy! You also did a splendid job in September organizing and managing our Texas Barbecue for our Cape Cod friends. Your creative ideas made the loud and lively evening so much fun for everyone. We look forward to planning some more Hyannisport events with you in 2014. Cheers! Dana – thank you so very much for my birthday party celebration dinner! It was so nice for me to have you cook everything. I will have to tell Eric at Pie in the Sky that you are a really good chef. 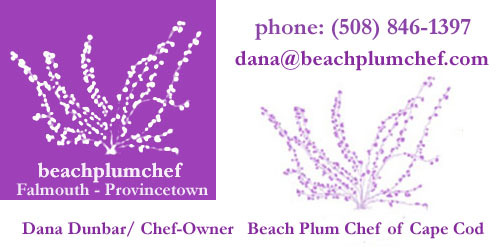 (Beach Plum Chef Notes: the referral to cook for this event came from a Boston-based chef who is connected with “Pie in the Sky” – a really good bakery in Woods Hole). You deserved the standing ovation at the end of the night – you guys really worked hard – and the food was delicious! So nice to meet you and Maureen. It was a pleasure, and I will definitely recommend you! Dana – I can’t thank you enough for the absolutely fantastic job that you and your staff did tonight. My guests were really happy – I was happy – that group of people that you work with is phenomenal (BPC staff included 8 servers) and it was all done exactly the way I wanted it. You know that I am very particular – and you handled it well. From the tasting menu you brought in April – to tonight’s dinner for 55 of my close friends and family. It was a very special night – and you supported that. The food was excellent…. I highly recommend your service. My body is so happy! It is such an incredible pleasure having you cook such wonderful meals! I am so excited to eat and to have more time with my kids…. The soup you made was absolutely wonderful!! I wish you could understand how much joy it brings me to eat such amazing food! You are so awesome at what you do!!! My dinner tonight was soup and salad with the dressing you made!!! I am in food heaven if there is such a thing!! The menu for next week looks divine!!! Thank you! Thank you!! Hi Dana and thank you again for a fantastic meal…both Bill and I enjoyed it immensely!!! We also so appreciated your thoughtfulness in leaving us your delicious cookies…what a nice surprise to wake up to….I would highly recommend you and will certainly look to have you come cook for us when we are on the Cape again…we both fell in love with the place. We have had other chef services come and cook for us, but you really hit the mark. The food was excellent – we really enjoyed our evening. And we would definitely recommend your services. Thank you for a lovely dinner that supported a very special celebration for us! We loved having you cook for us at the Cape. It was one of the highlights of our weekend. The food was amazing! Thank you so much for your time and effort. Your entire team was a pleasure to have around. I hope that we can make this trip to the Cape an annual visit. If so, we would certainly contact you every time! Dana/Beach Plum Chef delivers (in more ways than one!). We recently planned a one-week getaway for a group of long-time friends… Dana was tasked with assembling sample menus, preparing healthy put-away meals, and creating a staffed celebration event starting with appetizers and ending with a decadent dessert. She did it all with finesse and received rave reviews (no small feat considering we are very discerning group of women!). Dana was considerate of various dietary requirements and as requested, used only fresh, locally sourced ingredients where applicable (from farmers’ markets); she was flexible and happily made substitutions where necessary; and as a one-woman business owner, Dana was attentive to our needs, honest and a pleasure to work with. Lastly, the difference is often in the details and Dana’s attention to the little things (using her own fresh garden flowers on the table and as an edible garnish) puts her in a category beyond ‘caterer’. Dana loves what she does and it shows and tastes! Can’t thank you enough. It was a great experience starting with our first conversation and how willing and interested you were in figuring out what I or Nicole would actually want. It was truly wonderful. The ambiance WAS incredible. We have had several parties at the house including our wedding and we are always concerned that one event might be too similar to the next. This was not the case at all as this was so unique. Thank you so much for making “40 years of living” so special!! The meal and service were absolutely spectacular! Our guests are still raving about it! Brenda and I wanted to thank you again for everything you did to ensure the celebration dinner you put together for our wedding day was absolutely perfect! Your attention to every little detail prior to and on our big day did not go unnoticed…..From listening to our vision of the evening and making wonderful wine recommendations, to arranging beautiful flowers and candles on our dinner table without being asked. Not only was our food delicious, each course was wonderfully presented. The extra care you took to personally introduce each course to our small dinner party was a nice touch as well. The passion for your craft is evident and so appreciated! We’re happy you were a part of our special day and we look forward to using your chef service every year when returning to Provincetown to celebrate our anniversary. Thank you so much for preparing such a fabulous dinner for my 60th birthday! It was such a pleasure going through the preparatory details with you prior to our event. I love your “fit for life” concept of food and you were able to combine that with so many gourmet abilities. You were anxious to share your ideas with me and yet still focus on our tastes as well. Although our guest list was only thirteen, you stood by me with various changes that occurred through our planning process and enabled me not to worry at all. As soon as you set foot in our home, you took over and immediately I knew the evening would be perfect. Your abilities as a chef became clear as you made the most amazing appetizers and served them to our appreciative guests. The sit down dinner was well-timed and not rushed. Each dish that you presented wowed us until the next . This dinner was the first time I ever had a professional chef come into my home to prepare and cook dinner. What a treat! It was an elegant evening and I was able to enjoy my own birthday party, relax with my guests and partake in a gourmet event! You were so on top of everything and your confidence let me step back and enjoy. Dana, thank you for a wonderful evening. All of your efforts were appreciated by my family and my dear friends. I highly recommend you as a true chef, and also as an event planner that knows how to work with people and make their event special. This was a special evening and the best birthday party! We really enjoyed the class. What do you get for the man who has everything? And now you know that we really love our lobsters. We had a good time, and the dinner afterwards was excellent. We’re glad you were able to sit with us for dessert for some apres social time. We highly recommend the experience. Have a class with Dana – you’ll learn a lot and get to eat something great at the end! Dana was a phenomenal chef for our wedding. My husband and I cannot thank her enough for all of her time and effort she put into our event to make sure that we had an amazing spread of the most delicious and organic food. From the start Dana was a pleasure to work with and gave us her undivided attention to plan the menu down to the smallest detail. Since we had a small destination beach wedding in Chatham (we live in Pittsburgh) she also played a major part in our wedding planning by helping us coordinate the tent, rental equipment, flowers, etc. This was an amazing help to see that the event went smoothly! I can honestly say that Dana’s effort in the planning phase was beyond our expectations and that the food was the best we have ever had. My husband and I highly recommend Dana as a chef for any event. I first tasted Dana’s elegant, healthful cooking while participating in a day-long retreat. I found it as inspirational as the program itself. I determined immediately not to let her get away. Most recently, I requested help with a dinner to honor friends and business associates from Lebanon. Dana developed a spectacular menu for 25, with subtle Middle Eastern influences…. While managing a staff of two, she made it appear effortless and conversed easily with guests. Beyond the obvious tasks for this undertaking, she had also done her homework in knowing the backgrounds of those in attendance…. I am of the personal opinion that Dana Dunbar could run a small country. My family was very pleased with your catering efforts during our family holiday in West Yarmouth, Mass (the Cape). As you know, each year we plan a special week for all of our children and grandchildren to meet at a place of their choosing. We supply the home and a chef and then begin to celebrate our fortune of being together for another year. During our July 2011 holiday, we were also fortunate to have you as our chef. Working with our family of 13 ranging in ages from 70 to 7 months, the meals were one of the highlights of this occasion. You helped plan each meal and your pricing was extremely fair. Thank you for all that you did.Your meals were delicious and served perfectly and the home’s owner complimented us on the cleanliness of the kitchen when we left. Your “Personal Chef” services for Peter and me after I returned home with my knee replacement was truly the gift of a lifetime. We are so grateful to our sons and daughters-in-law for arranging for your services. The health-giving/ comfort entrees were delicious. What fond memories I have of the scrumptious apple strudel! Not having to do meal planning, grocery shopping, and meal preparations was such an aid in my recovery! Every family should consider such a gift. When family members asks “what could I do for you? the patient should reply “Hire Dana Dunbar as your Personal Chef!”. And thanks for making the entire cooking experience in my home so easy! I am writing about Dana Dunbar who worked as production manager and chef. I was shooting a feature film, Radio Cape Cod, shot on Cape Cod in Woods Hole. She was with us for three weeks and lived on the property…. Dana has an ability to organize an event on short notice. She worked well with our head chef, Hubert Hohler, executive chef at the Buchinger Klinik and Spa, who came from Germany for our Woods Hole production. She also took over from him for one week (to work as chef for cast and crew of 30 persons), while he was making a cooking show on the Radio Cape Cod location. Buchinger Klinik is known as one of the best of its kind in Europe, and we were fortunate to have Hubert fly in to work with us. And we were also fortunate that Dana was there to offer support. I know that she took care of matters as if she were in her own home. She tends to be a nurturer, part chef, part personal caretaker in the kitchen, always looking out for others. I would recommend her both as a chef and as a person who will support the needs of crew and client. Dana was a pleasure from all aspects of our event. The food was wonderful and matched our event, her staff was intelligent and efficient – setting up, serving and cleaning up and fit in nicely with our guests. Dana’s pre-planning was thorough from the menus, to set-up of the rooms, to parking, to weather changes. She’s smart, approachable and not afraid to work hard. She really did think of everything and planned for it before hand to the point where the event seemed effortless. She is the consummate professional. I highly recommend Dana as a chef and also an event manager who will be very interested in supporting and representing your personal tastes. I get the feeling that she tends to work as a personal assistant rather than as simply a chef who makes menus for clients. Thank you again for your superb food. Our staff dinner was the best. Being able to host it in the warmth of our home as opposed to in a restaurant but with fine dining restaurant-quality food made it so very special. I think the one thing you might do is to put something in writing, maybe a card, that says something like “We wanted to be especially generous with our portions to ensure a plentiful, bountiful meal for your church staff.” … I don’t know really, but some way of letting folks know of your purposeful generosity. It speaks well of you that you were so generous and signals that we received much more than we paid for. Many blessings in your great personal chef/catering business. If the occasion arises to call upon a caterer in future we will certainly check with you. Last night’s meal was a huge success. And judging from the state of my house and the hour the last guests left (1:45 A.M.) the party was, too. Everyone loved the SW fare and the cookies were extremely popular. What a treat not to have to do all that work myself! Thank you for all your hard work and thoughtful process. Ann Steadman Hajduk Landscape Design, Inc. Thanks for a great job on Saturday. There was a lovely mood and flow and delicious food. Our guests had a great time thanks to your hard work and creativity. The soup is FABULOUS!!! So far I have had tomato and mushroom. Tonight will be squash. Thanks again. (Client request: 5 soups she could drink from a straw).